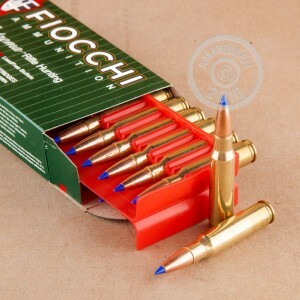 Take your deer hunting to the next level with this Fiocchi ammunition featuring Barnes TSX bullets. Each cartridge in this box of 20 fires a 168 grain solid copper hollow point bullet designed to produce dependable four-petal expansion for quick, clean kills. A muzzle velocity of 2,670 feet per second produces typical .308 Winchester/7.62 NATO ballistics. 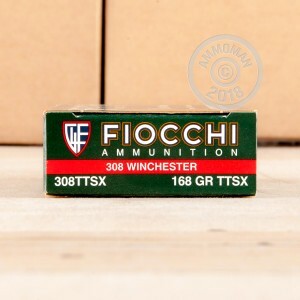 Most Fiocchi ammunition sold in the US is loaded in Ozark, Missouri. Barnes bullets are made in Mona, Utah. These cartridges use non-corrosive Boxer primers and reloadable brass. Remember to place an order for $99 or more to get free shipping from AmmoMan.com!